TSNPDCL JPO Hall Ticket 2019 is Out. 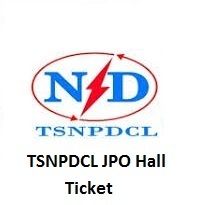 The TSNPDCL JPO Hall Ticket 2019 is issued by the higher authorities of the Telangana State Northern Power Distribution Company Limited (TSNPDCL) at tsnpdcl.cgg.gov.in. The board members are conducting the Junior Personnel Officer (JPO) exam on 10th February 2019. So, the officials released the Telangana State Northern Power Distribution Company Limited Admit Card 2019 on 4th February 2019. Furthermore, aspirants who registered for the Junior Personnel Officer (JPO) vacancies, they must and should have to download the tsnpdcl.cgg.gov.in Junior Personnel Officer Call Letter 2019 only through online mode. For the comfort of applicants, we had arranged the simple set of instructions to download the TSNPDCL JPO Hall Ticket 2019 from the official site of తెలంగాణ రాష్ట్ర నార్తరన్ పవర్ డిస్ట్రిబ్యూషన్ కంపెనీ లిమిటెడ్. And also we had attached a direct link to download the TSNPDCL JPO Hall Ticket 2019 for free of cost. In the below table, we had provided the entire details regarding the TSNPDCL JPO Hall Ticket 2019 such as starting date, ending date, organization name, the name of the vacancies available in the organization, and the total number of seats available in the organization. And also about the exam date, admit card release date, selection process, location, and official site. Candidates who are unable to download the TSNPDCL JPO Hall Ticket 2019, they can follow the below set of instructions. For more details about the TSNPDCL JPO Hall Ticket 2019, postulants can support our site that is Sarkari Naukri. The TSNPDCL JPO Hall Ticket 2019 is essential for all the candidates who are ready to take the written test on 10th February 2019. Furthermore, applicants who had not collected their TSNPDCL JPO Hall Ticket 2019 through online, they are not able to attend the Junior Personnel Officer (JPO) written exam. The TSNPDCL JPO Hall Ticket 2019 will be released by the higher authorities of the Telangana State Northern Power Distribution Company Limited (TSNPDCL) on or before 10 – 15 days of the written exam. Furthermore, participants who will collect the hard copy of TSNPDCL JPO Hall Ticket 2019, they only have a chance to enter into the examination hall. Initially, candidates have to visit the official site of Telangana State Northern Power Distribution Company Limited (TSNPDCL) that is tsnpdcl.cgg.gov.in. Go to the What’s New section which is at the right side of the home page. In that search for the flashing link of Telangana State Northern Power Distribution Company Limited JPO Hall Ticket 2019. Fill in the details such as Application ID/Registration number, date of Birth, and One Time Password. Save and download the TSNPDCL JPO Hall Ticket 2019. Take two or more xerox copies of TSNPDCL JPO Hall Ticket 2019 to attend the exam. Candidates can also bookmark site Sarkarirecruitment.com for more updates on TSNPDCL JPO Hall Ticket 2019. Thank You.